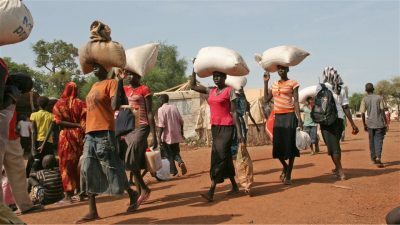 The Government of Japan has announced a contribution of US$3.2 million to the United Nations World Food Programme (WFP) to support WFP’s lifesaving relief operations in South Sudan, including specialized nutrition treatment for mothers and children and a critical aviation service for humanitarian workers. From the Japanese contribution, US$2.4 million will be used for nutrition support under WFP’s emergency response. This will enable WFP to assist more than 28,000 children and 6,660 pregnant women and nursing mothers with vital nutrition supplements. Women and children diagnosed with moderate acute malnutrition will receive specialized fortified foods to treat the condition and help them recover, while mothers and children in particularly food-insecure environments will receive highly nutritious foods to prevent them from becoming malnourished. The remaining Japanese funds – US$800,000 – will go towards the WFP-managed UN Humanitarian Air Service (UNHAS), which provides air transport and cargo services for humanitarian workers delivering lifesaving assistance in South Sudan. In 2015, UNHAS served 248 organizations, flying to 77 locations, as well as transporting light relief cargo. WFP requires an additional US$220 million for food and nutrition operations and another US$16 million to run UNHAS over the next six months in South Sudan.